Posted on January 18, 2018 at 5:30 pm. This resulted in timber losses, increased risk of forest fire, and high costs for dead tree removal for those living in alpine communities. 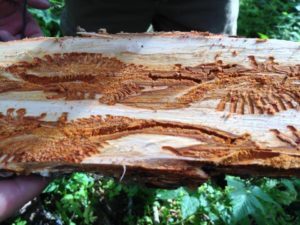 But with grant support from the U.S. Department of Agriculture, ISCA Technologies has developed an economical, safe, organic control product for the mountain pine beetle, Dendroctonus ponderosae, called SPLAT VERB. This innovation protects ponderosa, whitebark, lodgepole, Scotch, jack pine, sugar pine and limber pine trees from the damaging beetle that grows no bigger than a grain of rice. SPLAT VERB is a paste formulation that can easily be applied to trees with a caulk gun or with a squeezable pouch. It works for homeowners, property managers and foresters alike by slowly and consistently releasing a synthetic version of the naturally-occurring repellant that the beetles themselves release in nature to signal that tree is already fully occupied. To better understand how this innovation works, it helps to understand the bark beetle’s lifecycle. 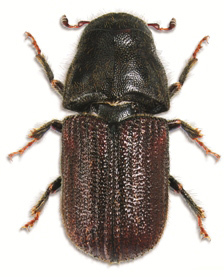 Every summer, a new generation of beetles emerge from cocoons beneath the bark of dead or dying pine trees and embark on flights through the forests to find new host trees. Once a group of beetles chooses a tree, they find mates and burrow through the bark to create tunnels or galleries, where they lay their eggs. These invaders also release a blue stain fungus into the sapwood that slows and eventually stops the tree’s natural defenses. The fungus curtails the tree’s ability to emit a defensive flow of sticky pitch. This allows the bark beetle eggs to hatch and the larvae to prosper. But the fungus also cuts the tree’s flow of water and nutrients, which kills the tree. Mountain pine beetle damage beneath bark. Once a tree is fully colonized, the beetles emit a pheromone called verbenone that tells approaching beetles that the tree has no space for them, and they should go someplace else to find mates. This chemical “no vacancy” sign ensures that each infested tree has enough inner bark tissue for the larvae to feed upon during the coming year. 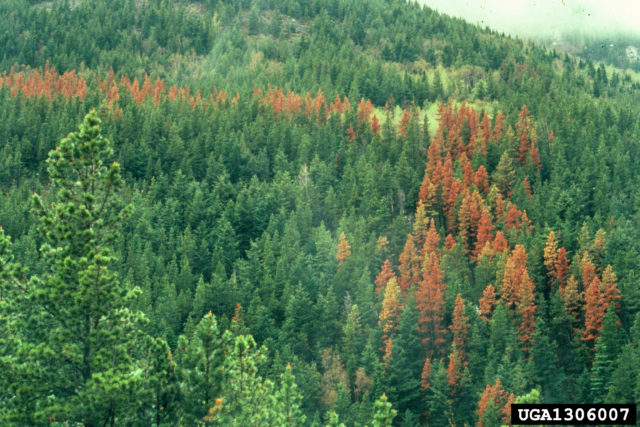 ISCA has found that when the verbenone pheromone is applied to a tree before first beetles arrive in the summer, it acts as a natural repellent and thus protects the tree from bark beetle infestations. Once applied to a tree, the SPLAT VERB formulation naturally breaks down and slowly releases a consistent amount of the verbenone to trick the bark beetles into staying away from treated trees. SPLAT VERB also provides a “halo” effect that protects nearby trees. When the repellent formulation is applied to a tree, a protective “halo” is essentially formed around it, protecting nearby neighboring trees. In 2014, extensive trials in California confirmed the product’s effectiveness. In collaboration with the U.S. Forest Service, ISCA treated 86 sugar pines in an area near Yosemite National Park prior to the beetle’s annual flight to find new host trees. The results showed that SPLAT VERB successfully repelled the beetles and protected the trees from infestation, while untreated trees in the area showed significant levels of infestation where high beetle damage lead to the death of many of the trees. SPLAT VERB is a completely safe product produced of food grade and environmentally friendly ingredients that only contact a small portion of the tree. The leading alternative treatment is to drench the trunk of a tree with the insecticide carbaryl. This chemical, however, is listed by the U.S. Environmental Protection Agency (EPA) as carcinogenic and it is toxic to birds and other wildlife. The EPA first approved SPLAT VERB for the commercial marketplace in 2013. It is now a safe, organic choice for homeowners, property managers, and foresters to protect pine trees.